Dr. Bruce Cunliffe graduated from the University of Minnesota with his Doctor of Veterinary Medicine degree in 1988. He worked as relief veterinarian in a small animal, avian and exotic practice for a short time before accepting a position at Blue Cross Animal Hospital in Minneapolis. Blue Cross Animal Hospital was a full service small animal practice focusing on medical and surgical care of dogs and cats. It was there that he met his wife Julie, who was working as a certified veterinary technician. After working there for a few years, he began teaching Veterinary Technicians at the Medical Institute of Minnesota. He became the VT Program Director and held that position for 6 years before becoming Director of Education for the Institute. In 1996, he took a short hiatus from veterinary medicine, earning a Master’s degree in Horticulture. He moved to Wisconsin in 2000 and operated a nursery for 15 years while continuing to work part time as a veterinarian. He worked at We Care Animal Hospital in Clintonville for 8 years before joining All About Animals Veterinary Clinic in 2008. Julie and Bruce now own the practice, purchasing it from Drs. Andy and Becky Barr in 2016. They have two college age sons, Andrew and Ben, a dog named Ayana and a cat named Darlin’. They enjoy spending time with family and friends, gardening, camping, and serving at their church. My name is Rachel O'Brien, CVT. I began working at Associated Veterinary Services (now named All About Animals Veterinary Clinic) while in high school and continued through my years of college. I graduated from Madison Area Technical College in 1996 with an Associate’s degree in veterinary technology. In June 1996, I sat for the Wisconsin State Veterinary Technician certification exam. I have been a practicing Certified Veterinary Technician ever since. I rejoined the team at All About Animals in 2012. I own a lab hound mix named "Dude" and 2 cats named "Juice" and "Driver". I am married to Brian and we have 2 awesome kids, Ben and Katie. In our free time, we love going camping and fishing in the summer and snowmobiling in the winter. Dr. Kaytee Firnett Devroy, or Dr. Kaytee as she’s usually called, is a native of Menominee, Michigan. She completed her undergraduate degree in Fisheries and Wildlife from the University of Minnesota. 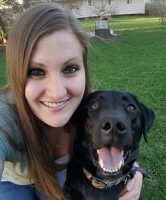 She continued on at Minnesota completing her veterinary degree in 2013. For the past five years Dr. Kaytee has practiced small animal medicine. Her interests include internal medicine, dentistry, and exotic patients. She enjoys challenging cases, even performing surgery on her pet chicken! Dr. Kaytee has been married to her husband Adam for two years. Their house includes a yellow lab named Mia and a golden retriever, Chase. They also have seven cats – Cinder, Pawly, Wall-E, Maddee, Peg Leg Haley, Kitten Cat, and Ted, a flock of chickens, and two fish. In their spare time Dr. Kaytee and Adam enjoy spending time with family, camping, riding motorcycle, and ice fishing in the winter. My name is Stephanie. I have been with All About Animals since May 2015. I received my Associates degree in Veterinary Technology in October 2015 from Globe University. Then went on to pass the VTNE in November 2015 to become a Certfied Veterinary Technician. I am originally from New London but have been living in Shawano since 2012. I live with my boyfriend Andrew and our 3 fur babies. Milo, is our labrador retriever, he is a great bird dog and enjoys upland and water fowl hunting. Doug, is my cat he loves to climb trees and talk. Winston is a Holland Lop rabbit, he loves cilantro and sleeping. In my free time I enjoy being with my family and animals. I am a movie fanatic and I also enjoy hunting, fishing and the outdoors.